You must pay a visit to all those beautiful small islands, coastal ports and marinas, where your sailing vacation turns into a vacation of dreams. Clear waters of Italy, summer breeze, splendid coast, vast choice of boats...they will all make your journey unforgettable. Sailing in Italy offers a possibility to explore marvellous waters, relax and enjoy in traditional cuisine and wines. Planning your vacation on board will sure awake all your senses. 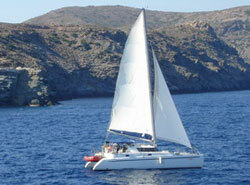 Choose among the variety of boats, catamarans, luxury yachts or motorsailers. Think about a bareboat charter if you feel you can manage to take the responsibility for navigation yourself. Otherwise, hire a skipper or a crew and enjoy your vacation to the full. Prices vary and depend on a boat type, base, charter period and equipment. However, your charter company will give you a detailed information regarding your request.